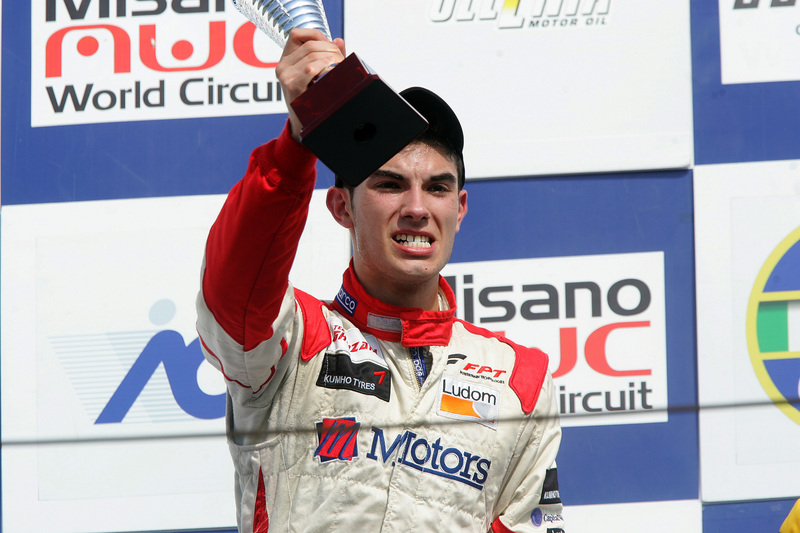 04/06/2011 - The second round of the Italian Formula 3 Championship undergoing in Misano Adriatico was colored in Ghinzani's red. Edoardo Liberati set the pace over the rivals at the wheel of the car lined up by the former Formula One driver and secured the second pole position of the season this morning which was followed in the afternoon by a splendid victory in race one and by the fastest lap of the race. This hat-trick awards the young driver from Rome with his first victory in Formula 3 and with the provisional classification leadership. The victory in the rookies' and absolute second place went to the Californian Michael Lewis (Prema Powerteam) who after starting third on the grid gained a position thanks to a brilliant start. Sergio Campana had a hesitation at the start which conditioned his whole race: he slipped down into fourth and then re-gained the third place of the podium after a strong overtaking to his team mate at BVM-Target, Maxime Jousse. Kevin Giovesi (Lucidi Motors) took advantage of that battle and hinerited the fourth place from the Frenchman's excursion in the run off. Race two is scheduled for tomorrow at 10.10 (local time, GMT+2) with starting grid decided by the inverted top eight of qualifying while the remaining places will mirror race one's results. Eddie Cheever (Lucidi Motors) will therefore celebrate his 18th birthday from the pole position after the seventh place obtained this afternoon behind Facu Regalia (Team Ghinzani). At his side he will find Raffaele Marciello, only tenth today, while the second row will be occupied by Regalia and Jousse, both up for an attack race. Liberati had a good start and got the lead to Lewis and Jousse, with the latter author of a good start in turn while Campana slipped down into fourth ahead of Giovesi. At lap two Mancinelli went out with the the left rear tyre missing. Liberati hammered down several fast laps and gained precious metres to Lewis and Jousse, with Campana fourth in Jousse's slipstream. Giovesi and Regalia followed fighting for the fifth position then Cheever, Maisano and Iaquinta, while Krohn defended his tenth place from Marciello, Roda and Guerin's attacks. The Brazilian spun at lap five while Iaquinta started to lose ground and had to give the ninth position to Krohn. Marciello got his slipsream but was then overtaken by Marciello and Roda proceeding Vecchi by about 3 seconds. Iaquinta stopped his car in the pits at lap seven and retired from a race seeing Liberati comfortably on the lead, then Lewis and the BVM-Target couple made by Jousse and Campana, fighting with each other. The driver from Modena was very close but the Frenchman managed to keep the third position even if quite just. On the back, Guerin spun and retired from the race. Campana tried in several occasions to overtake braking to the limit but the French driver did not lose his concentration. At lap 18 the Italian tried and attack that went through at Quercia turn forcing Jousse in the run-off area. Giovesi got advantage of this and gained the third position, while the French driver slipped down into fifth right ahead of Regalia, Cheever, Maisano, Krohn and Marciello that completed the top ten.